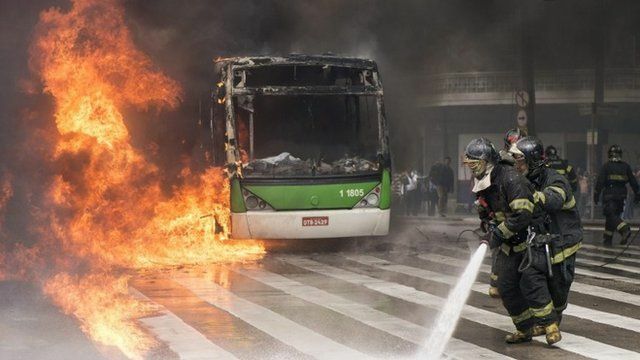 Clashes in Brazil following eviction Jump to media player There have been clashes in Brazil's largest city Sao Paulo following the eviction of 200 families occupying an old hotel in the city. Thousands homeless in favela fire Jump to media player A large fire destroys part of a favela in the Campo Belo district of Sao Paulo, Brazil. Clashes during Pope's Brazil visit Jump to media player There have been violent clashes between protesters and police after Pope Francis arrived in Rio de Janeiro. Rio clashes follow day of strikes Jump to media player Police in Rio de Janiero have clashed with demonstrators after a day of strikes across Brazil, called by the country's largest trade unions. Brazil clashes ahead of football match Jump to media player Police in Brazil have clashed with demonstrators in Fortaleza ahead of a Confederations Cup football match between Spain and Italy. Authorities say the families had failed to meet a judicial deadline to leave the building. But the occupiers claim there were not enough vehicles provided to remove their belongings.